This unique Rings of Saturn motif watch is illuminated by a striking, vivid and powerful brilliance, a precious allusion to the rings of Saturn. Black ring: jade, a stone rich in history and symbolism, a fine-textured and vividly coloured material that is both deep and fragile, cut to measure. 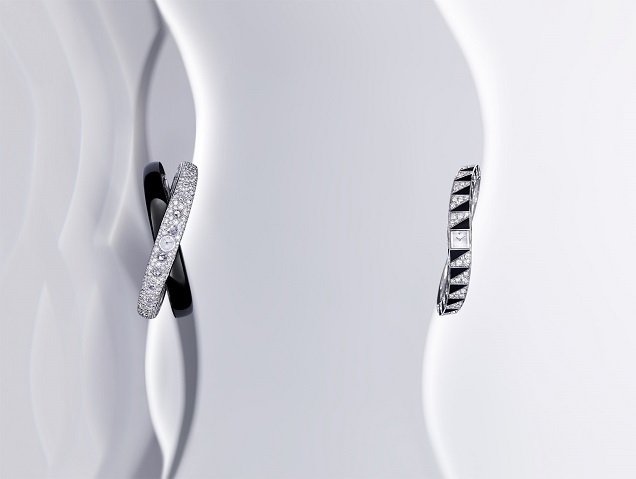 White ring: shagreen paving, in which brilliant-cut and rose-cut diamonds alternate in a random composition. Dialogue, exchange or competition for this creation, movement and stability enter into a dialectic that is crystallized into the dynamic form of the ellipse. On the diamond-paved ring, the watch’s crystal has been faceted, a jewellery technique adopted by Cartier to house the legendary calibre 101, which is considered to be the smallest manually wound mechanical movement in the world. Produced in only very small numbers each year, it has been an essential feature of luxury watchmaking for eighty years. Its small size makes it a popular choice for all types of audacious creative projects, whatever the aesthetic constraints and chosen materials. There are strong contrasts at play: the black and the white, the smooth surface of the jade, the material effect of the shagreen paving, the paving of minuscule brilliant-cut diamonds and the row of rose-cut diamonds – a balance achieved only after over 600 hours of work. The rings of Saturn motif watch inscribes the infinitely small in the heart of the immensely large, in a convergence that mingles elegance and virtuosity. 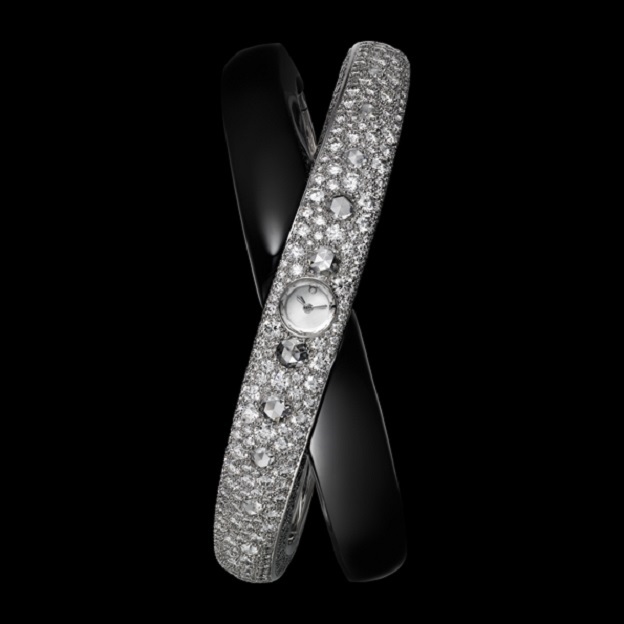 Rings of Saturn motif watch White gold, diamonds, black jade. Mechanical movement with manual winding, calibre 101.